Traditionally, the workplace was somewhere staff went to get their head down, tackle a to-do list and count the minutes until they could leave and resume their social lives. These days, the two are far more intrinsically connected and as private and professional lives have merged and continue to do so, this has given rise to new kinds of work settings. In offices of the past, staff had nothing much more than a dedicated workstation, a meeting room and a small refreshment area. For larger offices, there was also a boardroom and maybe a reception area but still nowhere near the diverse array of working environments that exist today. Modern workspaces have everything from creative collaboration zones to acoustically-enhanced private areas but in this article, we’re going to focus on the benefits of including social spaces within your office interior design scheme. 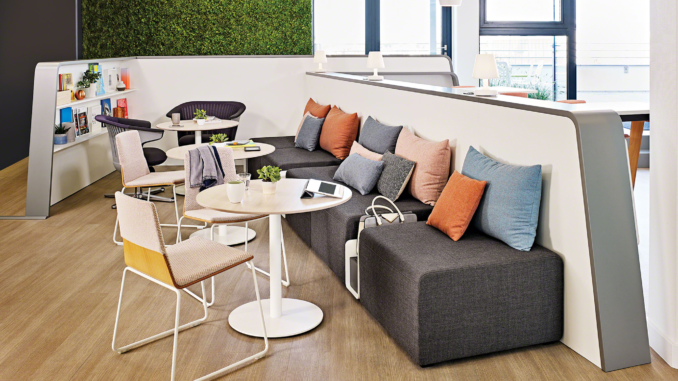 In a nutshell, a social space is an open, comfortable space away from the main working areas where staff can go to relax, rejuvenate, socialise with colleagues or take a break away from the desk for things like personal phone calls. Although it isn’t necessarily intended to be a place for work, with the right design and strategic facilities, a social space can also provide the perfect environment for impromptu, touchdown discussions when moving around the office. When you think of social spaces, you wouldn’t be blamed for conjuring up images of ultra-modern, Google-style workplaces complete with miniature golf courses, napping pods and a slide down to ground level. However, it’s important to remember that although social spaces are designed for downtime, they don’t need to be novelty or a gimmick. It just needs to be a well-designed area which encourages interaction and is accessible to all members of staff no matter what their status within the business. What are the benefits of an office social space? Including this type of setting within your workspace design might seem counterproductive to the untrained eye. Surely you wouldn’t want staff being distracted by opportunities to down tools and chat? Shouldn’t socialising be left to team building events, away days and nights out? Not when social spaces and office design have been proven to have such a profound impact on productivity, communication and mental wellbeing. Stronger communication lines between staff – Providing a place where staff can nurture their personal relationships will have a direct impact on communication lines within a work capacity. It’s simple really – staff who get on well will collaborate and communicate much more efficiently than those who aren’t given that opportunity. A boost in creativity and idea-sharing – As well as strengthening internal communication through bolstering social bonds, a social space is also the ideal chance for staff to communicate without the barrier of intimidation which often comes with the professional hierarchy. Levelling the playing field and enhancing communication this way will enable staff to think more creatively and share ideas with each other far more dynamically. A happier, healthier workforce – After providing a space for socialisation, the main objective of a social space is to give staff somewhere to go where they can relax, unwind and take a break before returning to their tasks in a refreshed state of mind. Permitting and facilitating this approach to work will have a positive impact on motivation, stress levels and emotional wellbeing to foster a more productive workforce. Accommodating the work-life balance – Another one of the greatest advantages of creating a well-designed social space is how it demonstrates your commitment to accommodating the work-life balance. Allowing staff to operate in this way makes communication with colleagues more natural and also helps create that home-from-home feeling within the workplace. The most effective kinds of social space typically combine a café or refreshment area with breakout style furniture such as soft seating and bench tables to encourage interaction. Incorporate a variety of different furniture styles to cater for various preferences, requirements and postures. Make sure there are plenty of places to plug in and power up to support multiple device usage. Cater for privacy as well as group interaction, just in case a member of staff should need somewhere to carry out a confidential phone call or concentrate on personal matters. Use a variety of different colours and textures to make the social space an engaging and inspiring environment that will foster creativity and collaboration back ‘at the desk’. Social spaces are also a great place to experiment with current trends including biophilia, resimercial design and the industrial aesthetic.